Salsify’s Product Experience Management platform (PXM) enables thousands of brands and online retailers to create, manage, and optimize the digital content that drives product discoverability and sales. Salsify combines the power of PIM and DAM capabilities with the industry’s broadest commerce ecosystem and actionable analytics to orchestrate a compelling product experience across digital touch points. The world’s biggest brands and retailers, including Mondelez, Bosch, Coca Cola, Rawlings, and Fruit of the Loom are using Salsify every day to stand out on the digital shelf. Over 55% of all product searches start on Amazon. Amazon’s giant product selection and helpful content has made it the go-to site for online shoppers researching products. With over half of product searches starting on Amazon, it has become a retailer you cannot afford to ignore. Join Salsify and content26 for a webinar on the ways you can use content and advertising to get your products discovered on Amazon’s digital shelf. We share tips to improve both organic and paid search on the site. Walmart relies on product content to help determine assortment, pricing, promotion, and drive every touchpoint across the customer shopping journey. Walmart Executive Ram Rampalli discusses the ways in which brands can provide this critical information. He outlines best practices to keep in mind to improve your Walmart go-to-market strategy and answers audience questions about Walmart Supplier Central. In our recently launched "Holiday Shopping Keyword Intelligence Report," we discovered that the 2016 holiday season drove a 30% increase in the number of top retail search terms. Not only that, 76% more product detail page content updates were pushed during an average holiday month last season. These are just two of the dozens of findings from last year's busy holiday season. To bring this report to life, we're putting on a live webinar that will arm you with actionable tips and best practices to ensure your product pages are ready for success during this year's holiday rush. 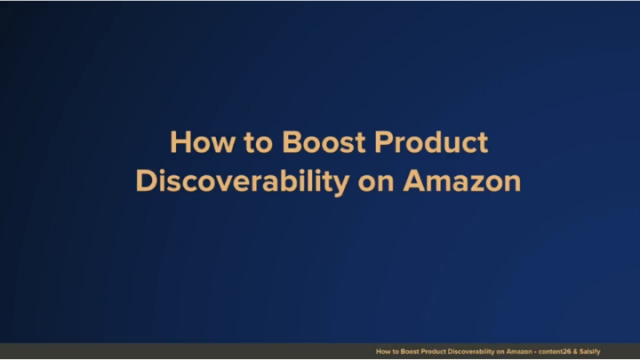 Boosting Product Discoverability on Amazon: Are your products standing out? Join Salsify and content26 for a webinar on the ways you can use content and advertising to get your products discovered on Amazon’s digital shelf. We’ll be sharing tips to improve both organic and paid search on the site.